Blogging under the moniker Bangers & Mash, it’s pretty obvious I am a carnivore. But in recent years I have drastically reduced the amount of meat I eat, for both health and environmental reasons, and view it much more as a luxury food rather than every day staple. 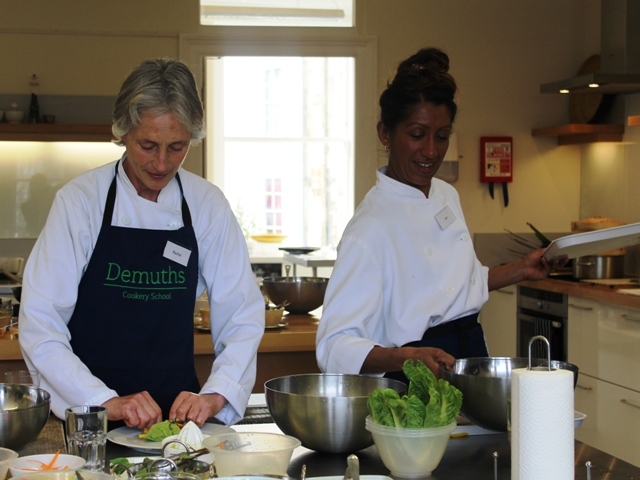 I’m always looking for new ways to cook more varied and interesting meat-free dishes and so when I was invited to try out a course at Demuths Vegetarian Cookery School in Bath I jumped at the opportunity. 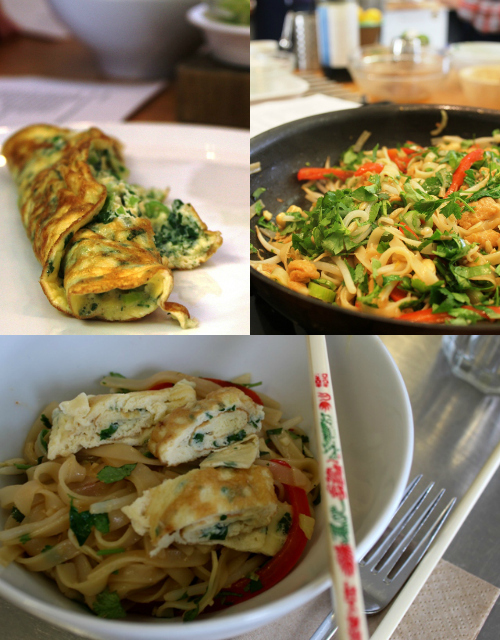 With my Malaysian heritage, I’m a big fan of South Asian food and so I signed myself up for the Asian Street Food course, hoping to be inspired by plenty of tips for healthy and spicy fast food and, in particular, the promise of learning how to make tofu tasty, which I’ve never had much success with in the past. Our tutors for the day were Rachel Demuth and Jan Berridge. Rachel has been a professional vegetarian chef since the 1980s and opened her restaurant Demuths in Bath back in 1987 (which she sold in 2013 to the head chef Richard Buckley). Rachel opened the doors to her Vegetarian Cookery School in 2001, firstly working from her home and now from beautiful premises in central Bath right next to the Abbey. Rachel regularly blogs about vegetarian cooking on the Demuths website – where I’ve just spotted a delicious looking recipe for spelt lasagne with asparagus and rocket pesto. Jan has been a tutor at Demuths since the very start. As well as being a brilliant vegetarian cook, she’s also an accomplished food stylist. She created many of the recipes taught at the cookery school and her specialties are desserts, pastry and presentation. Jan has recently set up a camper van hire business with her husband, so if you’re in the market for a luxury camper van holiday do check out Sun Kissed Campers. The dishes for the day were all Rachel’s personal favourites from her travels around Thailand, Laos, Vietnam Malaysia and Indonesia. Rachel says she loves light dishes such as these and at this time of year she finds herself craving fresh, light, ‘green’ food. I’m exactly the same. Particularly when they have a good spicy kick too! And all the dishes on Rachel’s menu were vegan too, except for the omelette served with the pad thai. It was a wonderfully relaxed day. Rachel and Jan were a fantastic double act, taking it in turns to take us through the various dishes at just the right pace and sharing their wealth of experience and knowlege. There were eight of us on the course, all vegetarian except for me (but I wasn’t made to feel a social leper – apparently many carnivores attend Demuths courses these days), and many of whom had been on to Demuths before and were thirsty to learn more. It was so lovely to be able to take our time over preparing our food – quite the luxury for me, as I’m generally in a bit of a rush in the kitchen, with children running in and out and clamouring for their next meal. It was a pleasure chopping and slicing vegetables, particularly when using a decent heavy knife (note to self: I really must invest in some better knives), which you must remember to sharpen before every use. Rachel told us for vegetarian cooking, you only need three knives: a large knife, a small knife and a bread knife. What was even more of a pleasure was having someone clear away all our mess and dirty utensils and do all the washing up! Recipes aren’t given out until the end of the course. 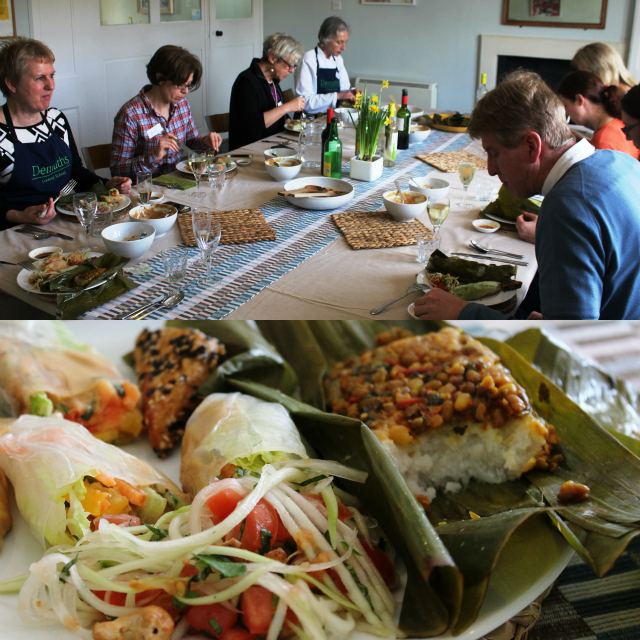 It’s important for participants to taste and feel the food, and learn through the cooking, rather than following written instructions. “You can’t get that from TV!” laughs Rachel. And throughout the session we were encouraged all the time to taste our food, as well as each other’s. Just a tiny bit more tamarind or soy can make a massive difference. It’s all about getting the balance right as well as working out your personal preference. The day started with an introduction to the various ingredients we’d be working with for our Asian Street Food menu, bringing together the flavours of salty, sweet, sour and hot. Sweetness would come from jaggery and palm sugar, sourness from tamarind, the heat from Thai chillies (the smaller ones are generally the hottest) and saltiness – usually Thai recipes call for fish sauce but the vegetarian alternative is a really good quality Japanese soy sauce, shoyu. Rachel recommends Kikkoman and Clearspring. They don’t use much, if any salt, in the cooking at Demuths. “It’s a lazy way of adding flavour,” explains Rachel. And then the preparation started. We chopped, sliced, smashed, ground and julienned all the ingredients we would need later on. That apparently is the key for Asian Street Food; it’s all about the preparation. The dishes themselves then take just minutes to cook. Pad thai has to be the quintessential food of Thailand, and this tasty noodle dish was super quick to cook up, once all the prep was out of the way. The pad thai was absolutely delicious, with slices of a simple herby omelette served on top. I’ll be cooking this for dinner this weekend when family come to stay. If I have a chance to take photographs, I’ll post the recipe on the blog at some point soon. 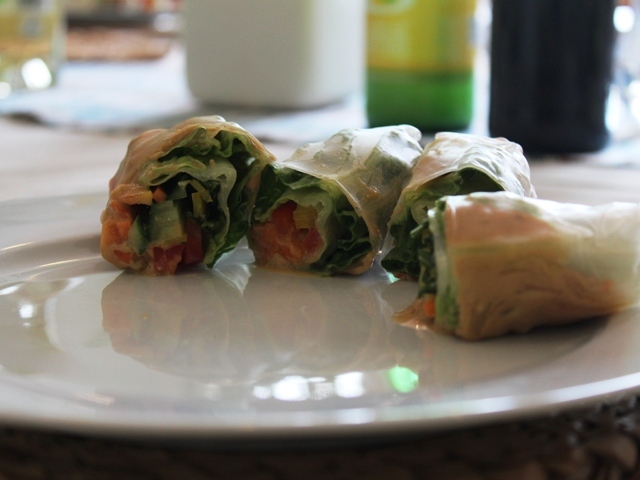 These light Vietnamese rolls are so fragrant and refreshing, packed full of crisp, raw vegetables with plenty of mint, Thai basil and coriander. While I generally enjoy tofu when eating out, it’s become something of a nemesis when I try to cook it at home. I will definitely be trying Jan’s tip of pressing it for an hour or so to make it firmer. Simply place it between a couple of boards covered with kitchen towel. It’s so much easier to work with afterwards. And less, well, mushy. 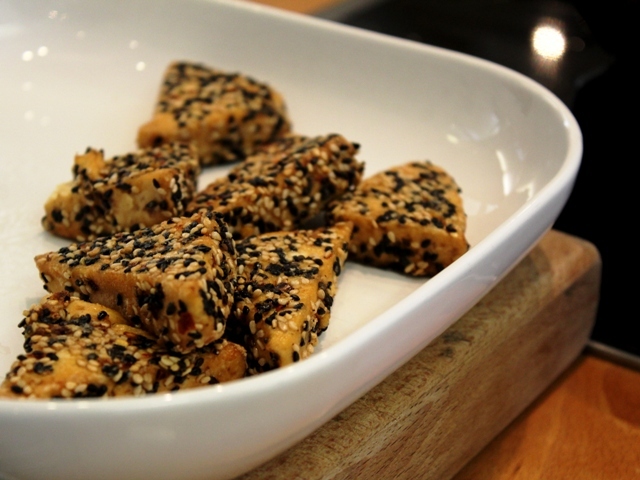 This crispy sesame tofu was pretty good, with a lovely contrast between the crunchy seeds and the soft tofu. And if you were to dip it into a good hot chilli sauce I think it might be quite sublime. The tofu is marinated in shoyu, ginger, sweet chilli sauce and apple juice for at least an hour or up to three days. The more flavouring you bring to tofu the better, it seems. I love how it looks. The combination of white and black sesame seeds is fantastic, don’t you think? These parcels were my favourite dish of the day. The instructions we were given for cooking up the spicy mung beans were very basic and we were left to pretty much our own devices with the ingredients on offer to come up with something that suited our own tastebuds. I really enjoyed working with my partner to come up with a concoction that tasted ‘right’ to both of us and combined with the soft sticky rice, well, I think I could live off this dish forever. This is another dish I was really looking forward to making. We always order this at our local Thai restaurant in Frome, the fabulous Thai Kitchen. (If you live anywhere near Frome and haven’t tried the Thai Kitchen, your really (really) must. 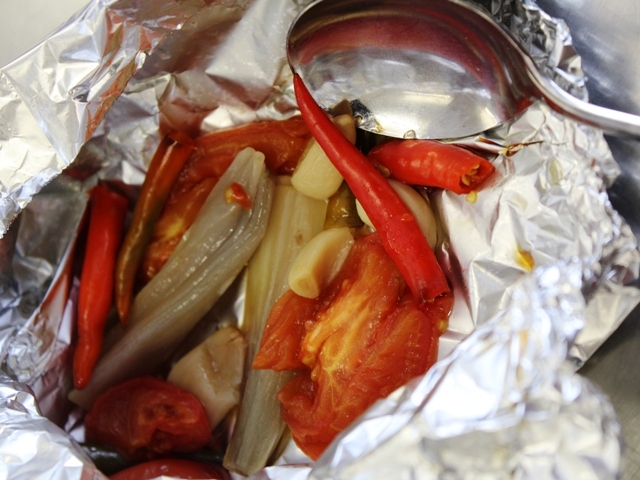 The chilli content of this salad was toned down quite a bit for the class, whereas I’m used to this being quite mouth-wateringly hot. When I make it again, I’ll be adding quite a few more Thai chillies. It is such a refreshing salad – perfect for the heat of Vietnam or Thailand, I suppose. I’ll be making this salad again soon, and promise to post the recipe on the blog. You can get hold of green papaya at most Thai supermarkets. There are a couple of Thai shops in Bath. There’s the Thai Balcony Minimart and the Banthon Oriental Supermarket in Weston. If you can’t get hold of green papaya, Rachel says you can substitute it for unripe melon, courgette, sweet potato or butternut squash. I took some of this home in my doggy bag (box). My family agreed it was the best peanut sauce they’d ever tasted. Result. 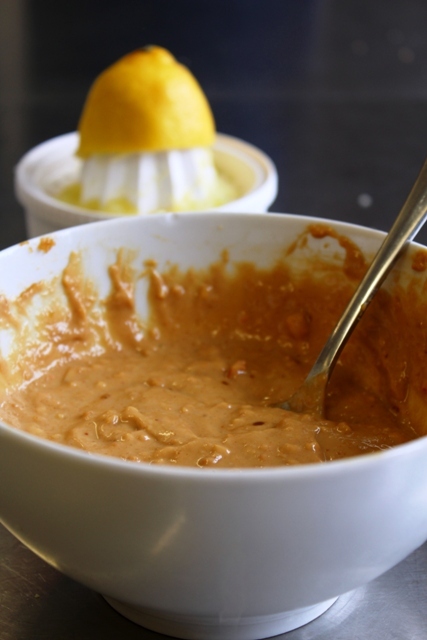 The secret, it seems, to this peanut sauce is to keep tasting, tasting, tasting as you go. As well as whole peanut butter, it contains rice wine vinegar, lemon juice, garlic, ginger, red chilli and shoyu. Just keep combining and tasting until it works. Nam prik means ‘chilli water’ and phao means ‘roasted’. Nam prik phao is the basis for Thai tom yam soup and is also delicious as a dip for raw vegetables and fried snacks. The traditional base for nam prik phao is roasted shrimp paste, and so for a vegetarian substitute Jan used roasted chillies, garlic, shallots and tomato with tamarind to give the traditional sweet and sour flavour. Once roasted, we mashed it all up to a sloppy paste with a pestle and mortar (great for stress busting) and boy, was ours hot! This was a fantastic condiment for the rice paper rolls. The pudding looked so stunning and I really wanted to enjoy it, but I have to admit to never in my life having been won over by a rice pudding. I had high hopes though that an Asian rice pudding might be the one to convert me. The sweet sticky vanilla flavours definitely appealed, especially partnered with syrupy mango and chilli, but no – alas it was still a rice pudding at the end of the day for me. And no matter how hard I tried, I was still transported back to school dinners. 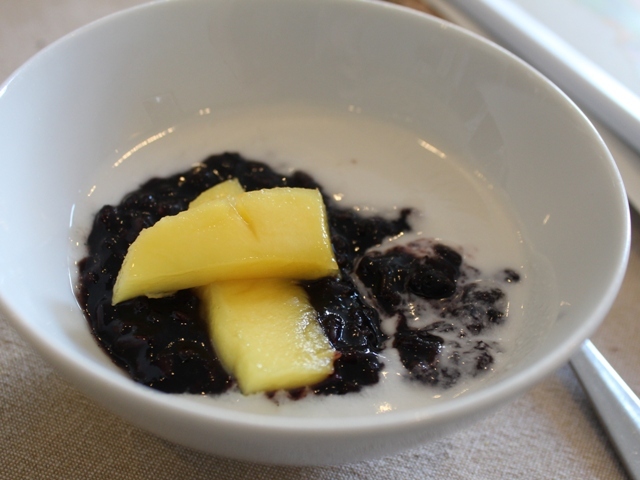 But if you like rice pudding, I bet this one will be the best one you’ve ever eaten. I had such a fantastic time with Rachel and Jan learning about South Asian food, ingredients and vegetarian cookery techniques; I really can’t recommend Demuths highly enough. It’s a very civilised way to spend a day, particularly as you all eat lunch together (that’s when we enjoyed our pad thai) and then again at the end of the day. What’s more there’s plenty of wine too, and even a glass of fizz when all the cooking’s done. I came away from my day at Demuths with a renewed faith in a vegetarian ethos, albeit as a part-time vegetarian, and with so many tips and ideas up my sleeve that I can easily see myself putting into practice in my day-to-day cooking. 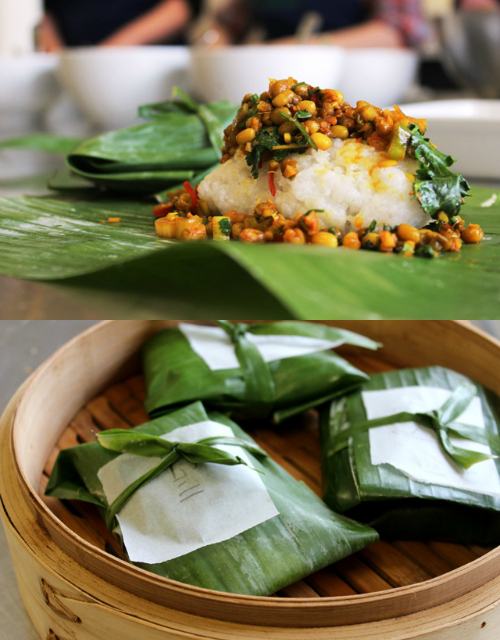 The next Asian Street Food course takes place at Demuths on Saturday 22 August from 10am to 4.30pm and costs £160. 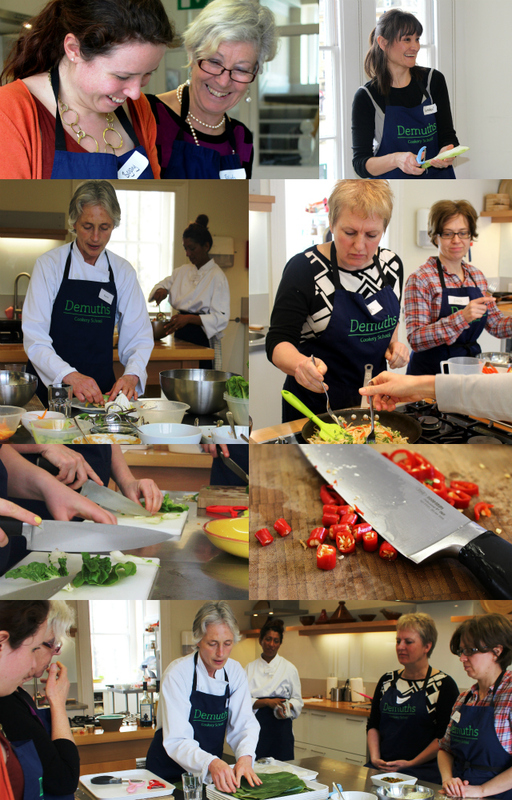 For details of all Demuths courses (from and cookery holidays, visit demuths.co.uk. 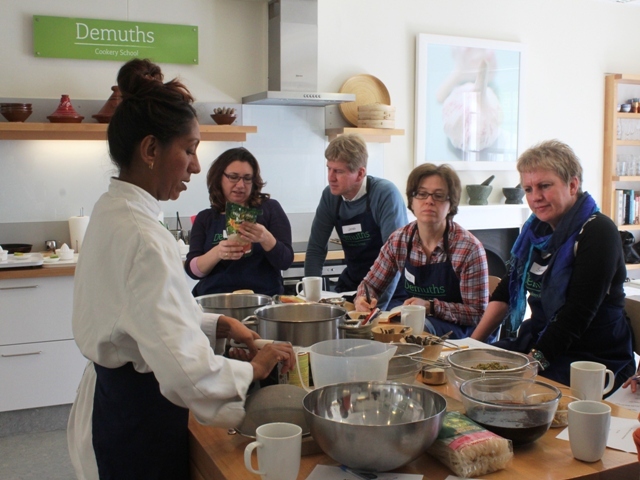 I attended the South Asian Street Food class as a guest of Demuths. No money exchanged hands and all opinions are my own. Fab experience and some lovely looking recipes. Looks like a wonderful cookery class, Great variety of dishes in the class. 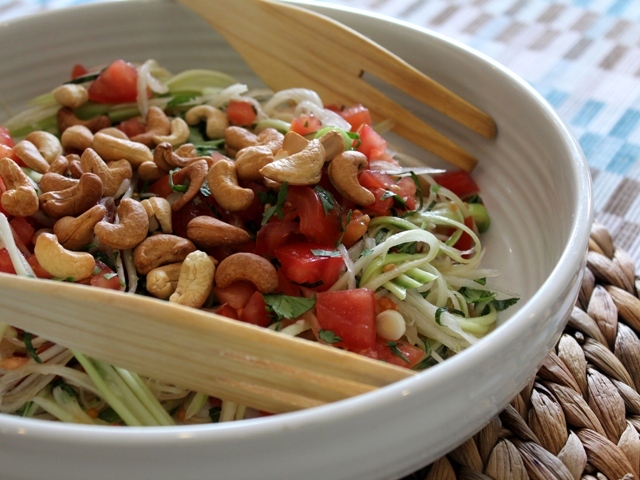 I am a huge fan of green fruit salads so I would have loved to make the green papaya salad. Oh very lucky you Vanesther. I love Demuths. A friend and I attended one of the courses their a few years ago and it was brilliant.